Its taken longer than intended to be here. Between this time, I slipped and slid deeper between cracks of workload. At this very moment, I have several windows running on my taskbar, sticky notes spread in all corners of my screen, many official mails to respond and a constant juggle with alt-tab keys to switch between the screens. There’s an excel sheet burdened with numbers everywhere, so heavy that I'll soon need to pop some pills to fight off my pounding head. My weary eyes have been rolling from ends to ends of screen with my fingers constantly prancing on the keyboard. The sudden surge in workload has been keeping me busy late nights and in offbeat hours. A bit of relief comes from this Indian Food Blogger Meet that I so much look forward to. When the girls at IFB meet got together and rolled out this idea, I instantly knew my calender had to be blocked for these two days. Despite being an active blogger for over 5 years, I haven't been actively participating in blogger meets owing to personal constraints. So when this came across, I sent out leave notes to my manager highlighting my absence from work for that day. IFB Meet has loads to offer. It comes with many unspoken promises. If you are not convinced, hang around here and you'll know the depth of effort these girls have been putting in to bring food bloggers together. I am looking forward to meet and greet many lovely people there, all sharing similar interests and passion for food blogging. It will be a great place to break ice with many fabulous bloggers whom I have never seen or met or virtually known. I trust my instincts that this will be worth every bit; that there will be an overload of fun, filled with learning, food, friendship, giggles, laughter and loads to take away! While food bloggers on facebook have been pouring in recipes for a line up of contests for the registered participants at IFB Meet, I wasn't too far from this temptation. IFB Meet 2014 announced The Urbandazzle Contest recently, where the participants are expected create an interesting monsoon / summer cocktail or mocktail recipe with an Indian flavour. 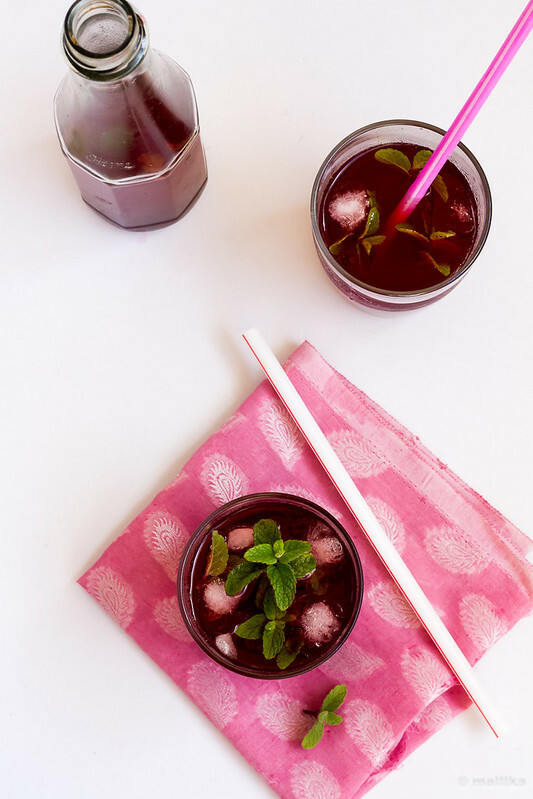 I put together this beautiful Kokum Mint Spritzer, quite inspired by an ingredient that belongs to my culture and is traditionally so Indian. I couldn't have thought of anything better. And I wonder how much more impressive this drink would look if you presented in UrbanDazzle Glassware! 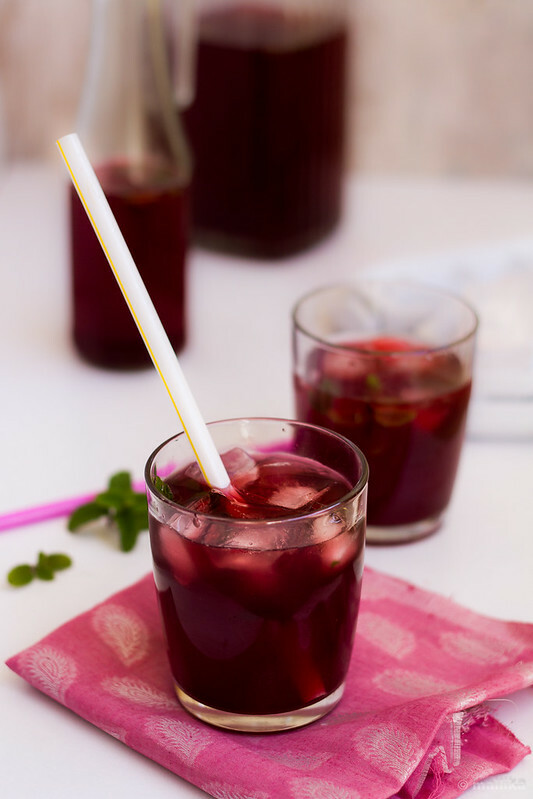 A stylish drink that's a perfect coolant on days when sun shines on your shoulder or when raindrops pitter patter on the window sill. To know more about kokum read here. Wash and soak the kokums in 1 cup of warm water for atleast 2 hours. Once they soften, grind them along with their water till they are fine in paste. Sieve them through and discard the fibre. Into the collected kokum juice, add in sugar and salt and stir well till they are completely dissolved. Allow to chill in fridge for 2 hours. 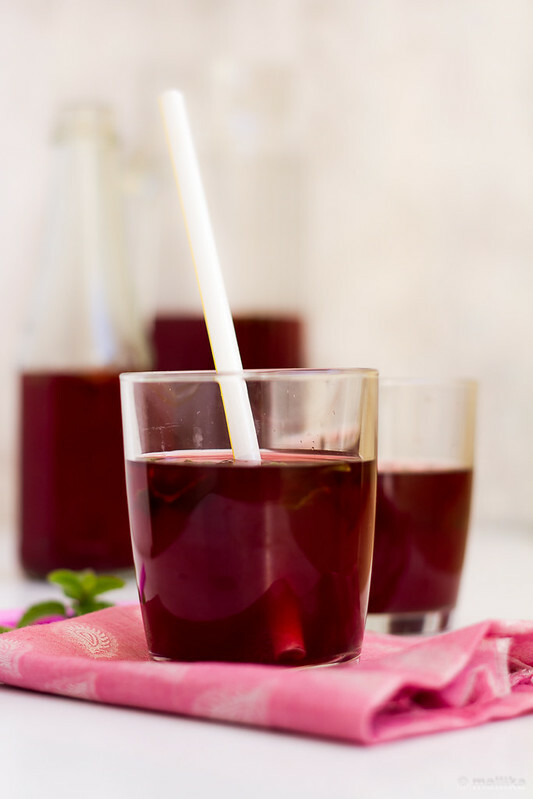 When about to serve, top with sparkling water or club soda. Add in broken mint leaves and shake vigorously in a cocktail shaker. Sieve and serve chill. If serving this to toddlers (as in my second picture), skip the sparkling water / soda and replace with regular mineral water instead. Top with mint leaves. Serve chill. Thank you Nandita! Hugs to you! Wat a drink, very catchy and attractive..
We landed in “vegbowl” only to get lured by your panorama of Indian vegetarian! 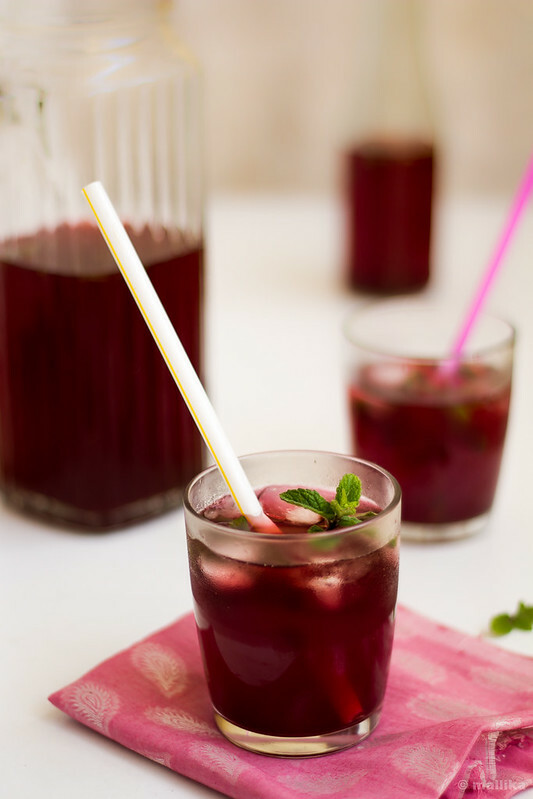 No wonder that food is wicked – “Kokum Mint Spritzer”! We would love to feature your culinary skills on our global platform. Sharing your passion for food might rejuvenate the taste buds and senses of millions of Indians living abroad. We’re awaiting your valuable reply.